Skin problems are among the most common troubles for dogs and cats. They can be caused by a variety of diseases, one of the most common being allergies. Allergies that affect the skin are grouped together under the term allergic dermatitis. As with people, our pets can suffer allergies related to the food they eat and the environment they live in. Additionally, they can have an allergic reaction to the bites of fleas and other parasites. More often than not, allergic reactions in cats affect the skin. If your cat is scratching incessantly, it's time to visit your veterinarian! Because itchy skin also can be caused by conditions other than allergies, your veterinarian may want to rule out the other potential causes, such as parasites, bacterial or fungal infections, or systemic diseases. Tests can include a thorough physical examination; evaluation for external parasites such as fleas or mites; skin tests to rule out fungal, yeast, or bacterial infections; and others, such as blood tests and urinalysis, to determine if your pet has a systemic disease. Once your veterinarian determines that your cat has allergies, the next step will be to find out under which category they fall. Food allergies are common, can affect cats of any age, and represent approximately 10% of all allergic conditions. After performing food trials to determine what ingredient your cat is allergic to, treatment involves feeding a diet that does not contain that ingredient. Another common form of allergy is caused by exposure to environmental allergens your cat either breathes in or absorbs through the skin. In people terms, we call this “hay fever.” Common allergens include house-dust mites; pollen, grasses, and weeds; and a variety of molds. While allergies often give people runny noses, they usually make cats itchy. Your itchy pet may benefit from topical treatment including cool baths, medicated shampoos and conditioners, and soothing sprays. If your cat has mild allergies, she may be treated with antihistamines or omega-3 fatty acids. More severe cases may require stronger medications such as prednisone or allergy shots. Flea allergy is the most common skin disease in cats (and dogs). It is also called flea bite hypersensitivity because it is caused be an allergic (or hypersensitivity) reaction to flea saliva. Fleas are very common and live both on your pet and in the environment. All pets in a household where there are fleas will be infested. In addition to causing allergies in susceptible cats, they can also transmit other diseases. Treatment for flea allergies involves eliminating fleas from your cat and the environment using products recommended by your veterinarian that are effective against all stages of fleas-from eggs to adults. To control itching your veterinarian might prescribe various medications including antihistamines, omega-3 fatty acids, prednisone and others. While there is no way to prevent allergic dermatitis, treatment is often very effective once the type of allergy has been determined. Check your pet often for fleas and watch for signs such as scratching or excessive grooming. 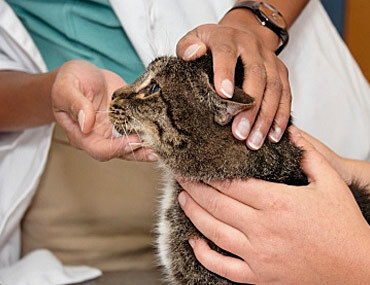 If you suspect your cat may have skin allergies, contact your veterinarian right away. Early diagnosis and treatment will keep your pet’s symptoms from becoming severe.